Poppy's birthday turned out to be fantastic. I'm still trying to wrap my mind around the fact that she's 4. 4 years old! That's just crazy. Her day started with her requested breakfast in bed. It was adorable how excited she was when she saw us carrying in a tray of muffins and donuts and juice to be eaten in her bed. Then we had Marc's family over for bee bim bop and birthday cake. Poppy said her favorite part of the day was opening all of the presents, of course! Mother's day was fantastic as well. The night before Marc asked if I wanted breakfast in bed, but I told him he could take the morning off. Instead we went out for a nice brunch with family. After brunch, Marc and I hung out outside while the babies were napping. It felt soooo good to be outside all day! Once everyone was up we headed to Uma and Upa's for more playing and then dinner. It's a bird feeder! We made a loaf of bread and covered it in seeds and then added painted sticks for the birds to sit on. Poppy and I thought it was rather clever, but everyone in my family seemed to think it resembled something that belongs in a toilet and they thought it was soooo funny. Poor Marc with all of these holidays. Just about every night this week, after I went to bed I could hear him get in the car and drive somewhere, and then come back an hour or so later. He was making runs to get stuff for our breakfasts in bed, flowers for mother's day, movies and snacks for our anniversary date night, etc. He did such a great job and I am so lucky to have him! 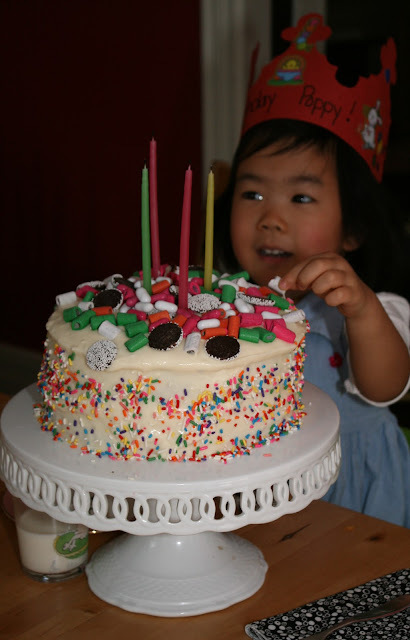 I love Poppy's cake, covered in all sorts of yummy sprinkles! Happy birthdays and Mother's Day! Sounds like a lovely mothers day as well as miss p's 4th Bday. 4!!!!!! Where is time going? Happy Happy Birthday Poppy! I cannot believe that she is 4! And happy belated mother's day! Looks like all your parties and celebrating have been lots of fun! Happy birthday Poppy! I can't believe that our babies are getting soooo old!!! Looks like all sorts of wonderful things happened in your neck of the woods recently... and FOUR?! How!? 3 down, 4 more to go.